Lee Irons has recently published a new Syntax Guide For Readers Of The Greek New Testament (SG). 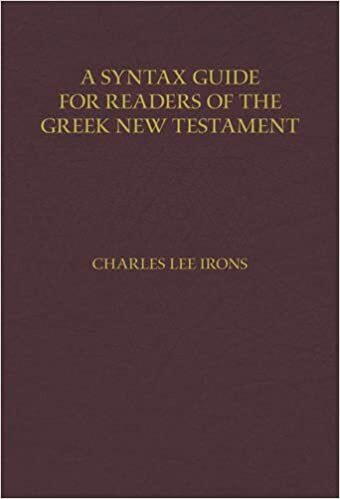 The purpose for this guide is to give readers of New Testament Greek a jump start in to the discipline of reading the New Testament in its original language. Typically studies of the Greek tend to either get overlooked or focus on individual word studies. What Irons would like to see is students of New Testament Greek take up the practice of reading whole sections of the Greek text and eventually the entire New Testament. However, anyone who has taken up that task has recognized immediately the difficulty before them in being able to readily interpret as you read. SG provides the syntactical information (i.e. idioms, syntactical categories, etc. )to help aid in understanding Greek phrases and sentences in order to “streamline” the reading experience. While this is a helpful volume it requires some prior familiarity of the Koine Greek. I would say this volume was ideally written for any one with at least two years of Greek. In fact the volume assumes it’s reader’s understanding of Greek. My only reservation is the Iron’s does not sight the sources he has used for his content. Then again this isn’t that kind of tool, which is fine with me as I have always known Irons to be competent with his Greek. This volume has several appealing features. First it follows the Novum Testamentum Graece, 27th and 28th editions. To me it even looks like the maroon hardback UBS Greek New Testament. There is also a subject index that allows the reader to look up verses by grammatical form. This is a very helpful volume. I have attempted to use it as Irons had intended and I found personally I come away with a better understanding of the text since my tendency is to skip over phrases or sentences that I didn’t understand. Definitely a must for any Greek reader’s reference library. I was listening to a couple of popular L.A. radio personalities as they discussed Islamic Jihad. For the most part they did well at describing some of the security risks with a religion that teaches violence in exchange for some eternal reward (not to say that all Muslims teach or believe that). Then all of the sudden in comes this assertion from the depths of ignorance that all religions have these same crazy teachings (referring to Jihad or holy war) including the Bible. I realize this is a radio program and its primary purpose isn’t the dissemination of accurate information. Moreover, if these personalities were not dramatically amusing and entertaining they probably would not be on the air. So for their purposes some generalizing is going to be necessary. However, the statement was made and it must have come from somewhere. It is often said that all religions are basically the same. This is more or less a civil attempt at religious pluralism for the sake of “coexistence”. The problem here is when the assumption that all religions are basically the same meets a religion where some of its adherents interpret the religion as commanding violence against non-adherents. The end result as we have seen above with the two radio personalities is a tu quoque (you too) argument where the religion in question avoids having to engage the criticism by turning the criticism back on the accuser who must either remain silent in such matters or by default be hypocritical. Notice this type of argumentation is a type of red herring in that it doesn’t deal with the issue at hand but redirects to another issue not relevant to the conversation. What is the issue? Does the Bible have the same violent teachings as the Qur’an? Nothing can be further from the truth. It is true that there are some violent passages in the Bible. However, the fact that there is violence in the Bible should not be confused with the idea that the Bible teaches violence against non-believers. Within the Old Testament we find commands of Israel to wage war against other armies, we also find the sentence of death for violating certain laws, etc. We could argue the tu quoque case that a late modern Western civilization whose seen more blood shed in one century than in all of human history isn’t the best judge of morality in the Old Testament. While that argument can be made I think there is a learning opportunity here that didn’t exist in history past when people were more astute in their personal observations and studies. Now if what I am saying is true, that the Bible and the Qur’an are not morally equivalent then what would distinguish them? The first point of distinction might be superficial but I think it’s worth mentioning that when we see Israel waging war against a foreign enemy it was for that specific time period and for that specific enemy. It was never an all out war against all enemies or in this case all non-believers everywhere for ever. More importantly as Christians we look to the Old Testament to explain the New Testament, that is key. The holy wars, the civil laws with their strict punishment, the animal sacrifices, these were all types and foreshadows of things that were revealed in Jesus Christ who is the fulfillment of that which was promised in the Old Testament. Interestingly the central story of the New Testament is not even about a militaristic prophet or leader. Rather it is about the life, ministry, arrest, public torture, crucifixion, and resurrection of Jesus who resembles more the suffering servant and not anything like the conquest of a militaristic leader. His teaching was not of a holy war but of the good news of grace which was the teaching that His followers shared through out the land. After Jesus’ death his followers taught this message of grace and discussed spiritual warfare but never talked about advancing Christ’s kingdom through militaristic conquest. It is my argument that when one reads the Bible and the Qur’an these basic distinctions will emerge to anyone with a modicum of literacy. 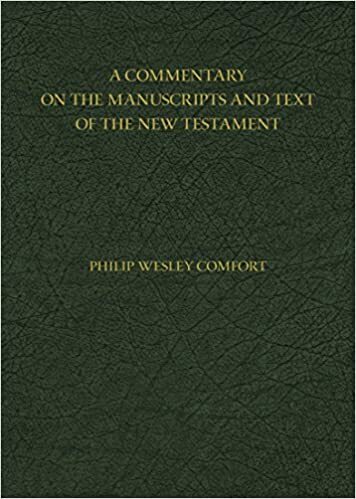 Just received my copy of Comfort’s A Commentary on the Manuscripts and Text of the New Testament from the publisher. Can’t wait to dive in.